Looks like harmless makeup to the naked eye. High-powered LED flashlight. 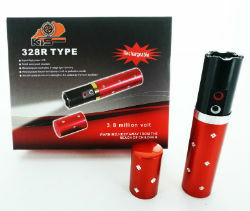 Super high voltage output stun gun. The material is aircraft grade aluminum and waterproof and is extremely durable in various conditions such as inclement weather. Charger included.